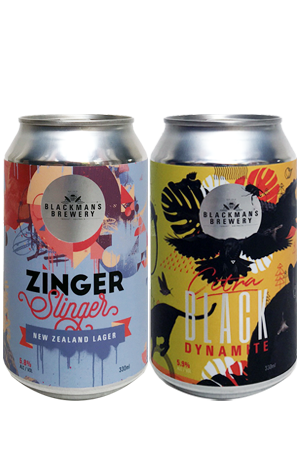 Early in 2017, Blackman's kickstarted its Lager Collective Series. As one of the few small breweries in Australia with as great – if not a greater – fondness for lagers as for ales, the idea was to showcase just how diverse the style could be. The first release was the Juicy Banger IPL, a beer in which they layered on big citrus and grapefruit aromas and flavours and won many fans in doing so. Two more beers have followed, with all three now out in cans at the same time. Citra Black Dynamite is pretty much what it says on the tin (albeit more of an opaque dark brown than actual black). It's certainly one to flummox most lager drinkers on every level, from its appearance to the punchy citrus, lime and passionfruit aromas from the Citra hops, which meld with chocolate, the faintest touch of roast and some dark treacle like stickiness. It still manages to deliver a pretty feisty bitterness despite all the sweetness and fruit that precedes it and makes for a companion piece of sorts to Feral's Karma Citra. As for Zinger Slinger, it's another India pale lager, one that takes inspiration from the New Zealand pilsners that helped bring the new wave of Kiwi hops to broader attention. Heaps of Southern Cross, Riwaka and Motueka hops deliver tropical fruits in abundance, although there's a broader sweetness at play here compared to some of the sharper NZ pilsners, which gives it a more prominent malty core and characters reminiscent of lime curd too.